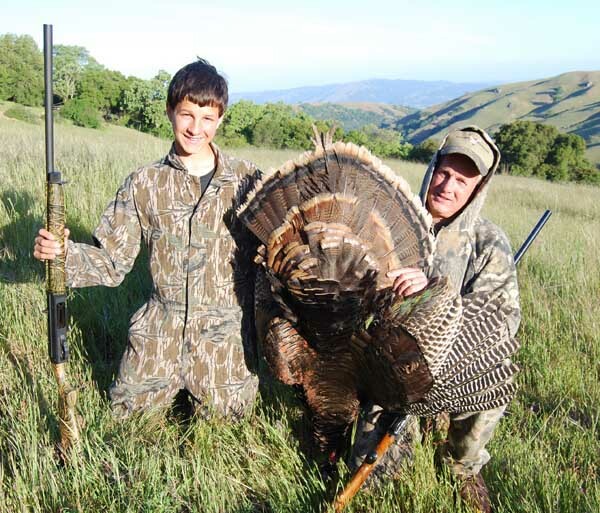 At the Livermore-Pleasanton MDF banquet/auction, Marty Sexton purchased a turkey hunt for him and his 14-year old son, Nickolas. We finally scheduled the hunt for Saturday April 26th and started early in an attempt to call a gobbler in at daylight. The early-morning approach meant getting up at 3:00 AM to be exact. We met on Highway 84 near Sunol at 4:10 AM and made it to the ranch before first light. When we arrived at the target location we were greeted by multiple gobbles from at least three sets of roosting gobblers. Good news. It didn’t take long to find a good set-up and within a few minutes we were settled in and ready to call. As the first rays of light lit up the canyon and improved visibility, I drew the paddle across the box call making a few soft yelps. It was immediately clear that the birds were eager as gobbles returned from seemingly all directions. A couple hens yelped from the oak trees nearby, adding to the drama. Not wanting to call too much, I reassured Marty and Nickolas that the birds would come when they were ready. At about 6:15, we were startled by the sound of air rushing over wings. Swooping in from the roost, a gobbler slammed on the airbrakes over our decoys and landed about 45 yards from Nickolas. 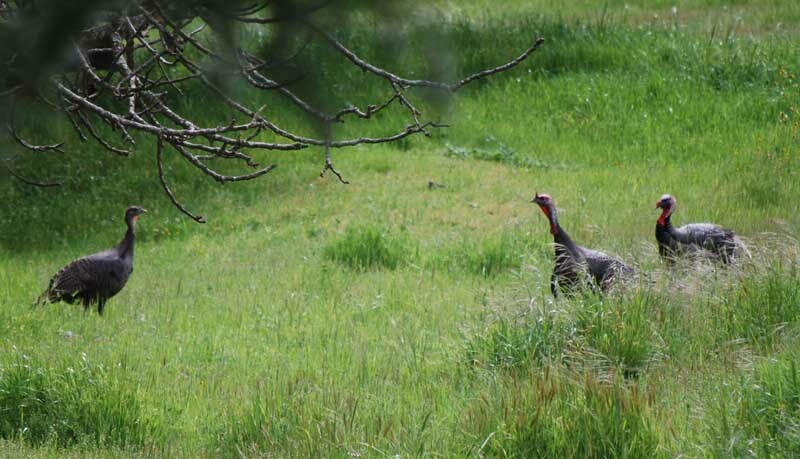 As the gobbler walked up the hill headed towards the jake decoy, Nickolas cut loose. The bird was hit, but not fatally. Expecting another blast right away, I was shocked as the bird began to walk away. Finally Marty joined in, hitting the bird again, but only motivating it to go airborne. As the big bird lifted off, Nickolas fired again and the bird was down for good. The gobbler was a two year old, with a 7 inch beard, a nice trophy. Landing right in the decoys is not typical, but it was exciting. We spent the rest of the day attempting to find another willing gobbler, but the early action seemed to make the birds nervous and unwilling to come to the call. I guess I can’t blame them. It was the second hunt of the week. On the previous Thursday, I joined my turkey-hunting friend Tom Billingsley for the day. The plan was for me to attempt to shoot a gobbler with my bow with Tom at the ready to kill the bird if I missed. Amazingly three different gobbler groups came in to our calling. As Tom made sweet turkey music on his box call, the gobblers strutted and fanned within five yards of me. I cut loose with a couple of shots. I couldn’t believe I didn’t bring one of them home, twice knocking feathers from the big birds, but drawing no blood. Tom passed up more shot opportunities than I could count, but he said it was too much fun watching me, so he didn’t want to shoot and end the day. Now I’m 0 for 6 on shots for the season, two of the last three were at 20 yards. I may have to break out the shotgun for the last weekend of the season. We’ll see. Do High Gas Prices Mean Fewer Mallards in 2008? Looks like ethanol production is causing more than just a shortage of corn for cattle feed. Not only is the price of gas going up, but so is the price of food. Increased food prices means more corn and wheat production this year. These prices are good for farmers, in fact they may be too good as far as duck hunters are concerned. As corn and wheat prices rise, farmers till and seed more and more marginal ground. The news from Ducks Unlimited is that North Dakota alone will lose about 15% of its Conservation Reserve Program lands to tilling this year. Therefore, a couple million acres of habitat will be put back into production. With changes on this scale, Ducks Unlimited is concerned that duck populations will be drastically impacted. Without habitat for nesting and water for brood survival, ducks perish. Will we see a reduction in duck numbers and bag limits this coming season? I guess we’ll find out next falll, but a reduction in duck numbers is probably what radio personality Tony Bruno calls “a stone-cold lock” or maybe its just a lead-pipe cinch. We’ll find out come October. Saw a pair of fawns yesterday. First of the year for me. Whenever I see my first fawn of the season, I can’t help but count back to the date it was conceived. I’ve been told that the blacktail gestation period is about 7 months. Various internet sites say it’s about 200 days. That sounds about right. So, an April 20 sighting would mean the fawns were conceived no later than September 30 meaning that the breeding could have taken place during the end of last hunting season. Yes, I guess there was some rutting going on. Also saw the first rattlesnake of the year this weekend. He was cold and motionless, but ready to spring into action as soon as the weather warms. 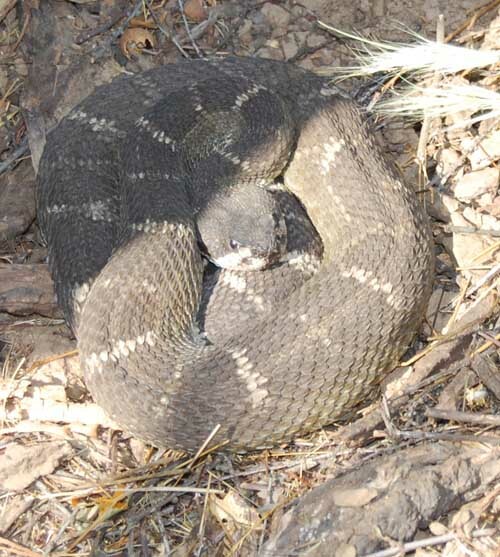 Our ranch hosts plenty of rattlesnakes and we see them primarily in May and June. That’s when we survey for Alameda whipsnakes. We don’t find a lot of whipsnakes, but we do see quite a few rattlers. 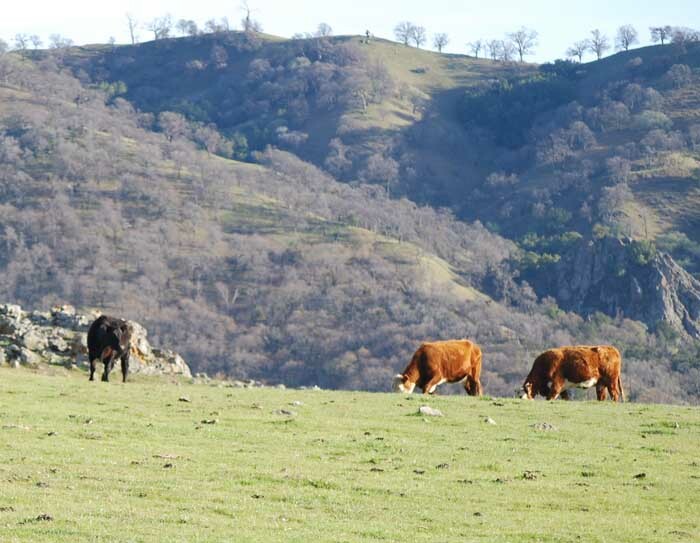 Our Alameda County ranch, like most ranches, has a variety of habitat types – oak woodland, oak grassland, riparian and chaparral. One thing that’s clear to me is that the effects one can have upon habitat in the hills are more subtile than the results one sees on valley farm ground. Our delta property responds quickly and dynamically to mechanical manipulation, herbicide use, water and grazing. Some of our local endangered species seem to do well with fairly heavy grazing. 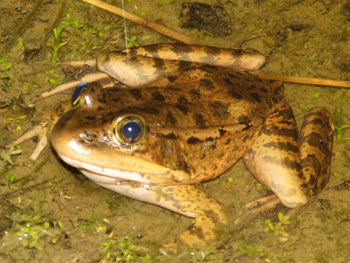 The California tiger salamander and California red legged frog, do well with moderate to heavy grazing but the burrowing owls seem to choose squirrel burrows for dens in areas with heavy grazing which may allows them to avoid predation. Managing grazing is pretty basic stuff. You put the right number of cattle on at the best time and take them off when you’ve reached the desired level of impact. Range managers use the term “residual dry mass” to measure the left over plant material when the grazing regime is over. Residual dry mass is the weight, per acre, of the plant material left behind at end of the grazing period. Many leases state that the property shall contain a species amount of residual dry mass at the end of the grazing period. Obviously fences are a key element of managing cattle. Being able to move cattle around gives the manager flexibility. Your ability to manage the cattle to benefit wildlife versus income is another factor. If you need to bring in every possible dollar for your grazing, you’ll be turning the decisions over to your lessee. Sometimes leaving decisions up to the lessee can create a “get it all” mentality leaving nothing to improve the habitat for wildlife. One grasses are gone, cattle turn to other plants and trees for forage. Water development is another key element of wildlife management. We recently looked at a ranch that had all its water sources diverted into water troughs. The thinking was that as a cattle ranch, the stock would be healthier with clean water sources. That thinking was OK at the time, but nowadays (especially near urban areas in California) wildlife resources have great value, not only from a game animal standpoint, but from the native species and endangered species standpoint. These turkeys greeted us upon our arrival at the ranch. So far turkey season has consisted of an opening day attempt. The turkeys were there and I had my chances. Choosing my bow, but not wanting to set up my blind, I chose to float and shoot from the sitting position while leaning against an oak tree, just as I do with my shotgun. Because my bow is very short (Mathews MQ32), I can shoot from the sitting position, but it’s not quite like standing. The problem with hunting without a blind is that the birds can see you draw the bow. For this reason, I decided to sit 30 yards from my decoy. This is farther than ideal, but sometimes compromise is necessary to give yourself a chance. I’d had a response to my calling from a single bird and set up to see if I could get him back. My yelping failed to entice him, but another group of birds responded from behind me. Another series of yelps from my box call got a solid round of gobling from behind me and it was clear that they were on the way. I sat silent and waited. Wearing my ghilie suit, I felt pretty confident that the birds would not recognize my outline sitting against the tree. The four birds came in behind me and walked by about ten yards to my right. They walked straight to my jake decoy. As they tried to intimidate the decoy, I drew the bow. They noticed my movement and became nervous. A wary old gobbler probably would not have put up with me, but the four jakes did. I was able to draw and release from 30 yards. My arrow tickled the bird, but did not hit any flesh. He moved a few yards and I missed him again. After the birds passed, I called and they came back resulting in a third miss from 30 yards. Although I twice ticked the bird’s feathers, I never hit him hard enough to even scare him off. Finally with two arrows left in my quiver and the birds drifting off, I decided it was time to regroup. Unfortunately that was all the action for the day. I’m planning to try again this weekend. I’ll take my blind this time and try to get the 20-yard shot that will make hitting a bird much easier. However, if they refuse to come close to the blind I’ll once again try it free-lance. I may take my shotgun along in case I wound a bird, but I’m going to stick with archery as my main course. Time to Buy a Ranch or Duck Club? Is this the time to buy a ranch? Duck club? Maybe not, but it is definitely the time to make serious progress towards buying hunting property. Here are some ideas to get you started. If you want a hunting ranch, you must have the means to buy it and you probably won’t get enough money to buy a ranch by putting money in your savings account or buying stock – unless you can identify the next Microsoft and buy it early. Why not? If you put money in savings or buy stock, you’ll have to use after-tax money to buy your ranch. The government will take 15-25% (or more) of the return you get on your earnings. So, unless you have a huge income, you’ll not be able to come up with enough buying power, or at least it will take longer to do so. On the other hand, if you purchase investment real estate, you will likely be able to transfer your equity from real estate investments to the ranch you choose and defer the taxes indefinitely. Yes you will have a tax obligation, but you won’t have to pay it until final liquidation of the ranch. If you own the ranch until you die, the tax consequences will be irrelevant in your lifetime. We’re in a buyer’s market. Now is a good time to purchase some types of real estate investments. The first type is the “no-brainer.” A no-brainer is an investment that comes along very seldom, but when it does, you’ll know it. Buy it. But because you can’t count on no-brainers here’s some other ideas. If I were a young aggressive investor with time on my side, I’d be looking for vacant land that has future development potential. I’d be trying to purchase with very little cash from a seller who could give me time to seek development approval before I had to come up with significant money. Or, if I were flexible about where I could live, I’d be attempting to use the buying power for my personal residence to purchase a home that had surplus property attached to it. Down the road the surplus property could be subdivided off and used to generate funds for a ranch purchase or other real estate investment. I’d also be looking for small residential properties that have investment bonus potential. Some properties have the potential to blossom as investments as time passes and neighboring properties come available. Often these properties sell for prices that do not reflect the “bonus” aspect. One situation like this is a house that, when combined with the house next door, generates surplus property – sometimes an extra building lot. The extra building lot may not be anticipated by the sellers. Unfortunately the down side is you don’t know when or if the neighbors will sell. But, if the home is in a typical residential area, the odds are in your favor as statistics show home owners tend to sell every five years or so. If you pull it off, you get the benefit of the appreciation of the property plus the bonus value created by subdividing off the generated lot. Sometimes properties may become appropriate for zoning changes that cause the property to take a leap in value. The big guys have the advantage here, and zoning changes don’t always work to your advantage, so you’ve got to be careful with this one. And, I wouldn’t quit looking for hunting property. An interest in a duck club or a small club you can purchase with a couple friends. You may find a small ranch that has enough hunting potential for you and also an occasional friend. Then as you accumulate more buying power, you can expand or combine funds from the sale of the smaller hunting property with other equity to purchase a larger ranch or duck club. By purchasing any high quality investment real estate, you are getting closer to owning a ranch. When the right ranch appears, get it into contract and sell your other property. By using the IRS 1031 Tax-Deferred Exchange rules, the equity can be transferred to the ranch along with your tax obligation. These are some of the ideas I’ve used to speed up the process of building up buying power, but don’t stop with these. Use your own creativity to make your investments successful. In order to do that, you’ll probably need to set asside time to study real estate investements in your area and ponder over investment strategies. Make good decisions. As I’ve said before, once you get to the point where you can own recreational property, you have an investment that gives you a continuous source of personal enjoyment while you own it, along with long-term income potential for your future should you decide to sell. The first step is to get started and today’s buyer’s market is a good time for that. About 15 years ago, an Oregon archer and bow hunting consultant, Neil Summers, told me about this mountain lion encounter. While hunting for elk in the Eagle Cap Wilderness Area of Oregon, Summers heard the loud growl of a lion. Standing in the depression of a rotted log, Summers looked up into the face of a crouched lion that stood facing him at approximately 12 feet. 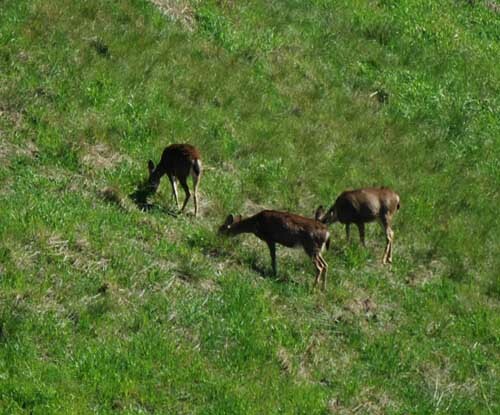 Summers was in full camo and had been frequently bugling like a bull elk. Apparently his bugles were convincing. He had elk scent on his clothing and elk droppings in a sock attached to his belt. To the lion, he smelled like an elk and sounded like an elk. He attempted to scare the lion away by squealing with his mouth diaphragm – now he was even acting like an elk. The lion had responded by growling and quivering with excitement (and anticipation of elk chops). Nocking an arrow, Summers took a threatening step forward, while once again squealing with his diaphragm (once again erroneously thinking he might chase the lion away). Probably convinced that this was about to be the best elk dinner he’d ever enjoyed, the lion sprung forward as Summers, in self defense, drew and released an arrow at point blank range. As the arrow pierced the lion’s vitals, the cat screamed and reversed course. A few seconds later, while still within a few yards of where Summers stood, the arrowed cat went berserk and died. Summer slumped to the ground – relieved, but still shaking with fear. This same technique might work for grizzlies. Anybody interested?